The placenta and fetus present a substantial challenge to the maternal immune system (Lu et al. 1991). Vigorous local immune responses can potentially activate maternal anti-fetal allograft immunity but a less than adequate local immune response would allow pathogens to enter the placenta and gain access to an immature fetal immune system that is ill-prepared to respond to them. Clearly, the balance between reactivity and suppression is most sorely tested when strong antigens such as microorganisms, alloantigens, novel placental antigens, or maternal autoantigens are expressed in the placental environment and become targets for maternal immunity. Irrespective of their etiology, the resulting immune responses can lead to adverse outcomes such as intrauterine fetal demise, premature delivery, fetal growth restriction, and organ-specific damage to the developing conceptus. As is the case for all organs, the placenta and implantation site contain populations of resident inflammatory cells that are believed to play crucial roles in placental development and function. The two most prominent (and occasionally misinterpreted) resident populations are large granular lymphocytes in the decidualized endometrium and Hofbauer cells of the villous stroma. The former have been shown to consist primarily of natural killer cells and are believed to play a non-immunologic role in regulating maternal vascular remodeling and trophoblast invasion (Ashkar et al. 2000). They tend to cluster near endometrial glands and maternal vessels without any accompanying tissue damage. The latter are tissue mac-rophages believed to play a role in villous vascular development and in protection of the fetus from pathogens and other potentially harmful mediators that might inadvertently cross the maternal-fetal trophoblastic barrier (Wood 1983; Anteby et al. 2005). They tend to be monomorphic in appearance and are generally uniformly distributed throughout the villous stroma. They are most prominent in preterm placentas. Notably absent from the uteroplacental arena are neutrophils, eosinophils, and B and T lymphocytes. It is the presence of these latter cells that constitutes pathologic placental inflammation. 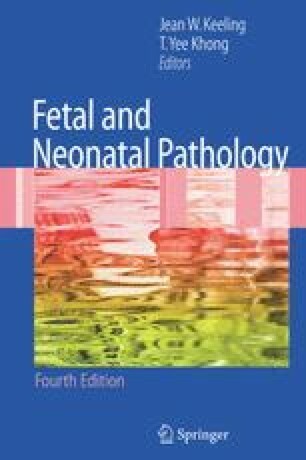 Acute neutro-phil-dominated inflammatory responses (predominantly chorioamnionitis) are observed in approximately 20% of all delivered placentas and are virtually always the result of ascending bacterial infections from the cervicovaginal tract (Kraus et al. 2004). Chronic lymphocytic inflammatory responses occur in 5% to 15% of placentas and are with rare exceptions not associated with documented infection. To what extent these latter reactions represent autoimmune or alloimmune reactions versus the sequela of previous infections or infections by as yet unrecognized pathogens remains an open question at this time.